One thing I have decided is to use the pattern I was asked to test out last year by Amy of Sew Incredibly Crazy (she has the pattern for sale on her website) for my super secret projects!!! I may also use this for Youngest’s quilt which I need to get cut out too with the fabrics he chose. One thing I do need though is more white from the quilt store as I used up my final bits on this one last year! One benefit of the cold weather is the wonderful winter dishes you can cook for dinner. 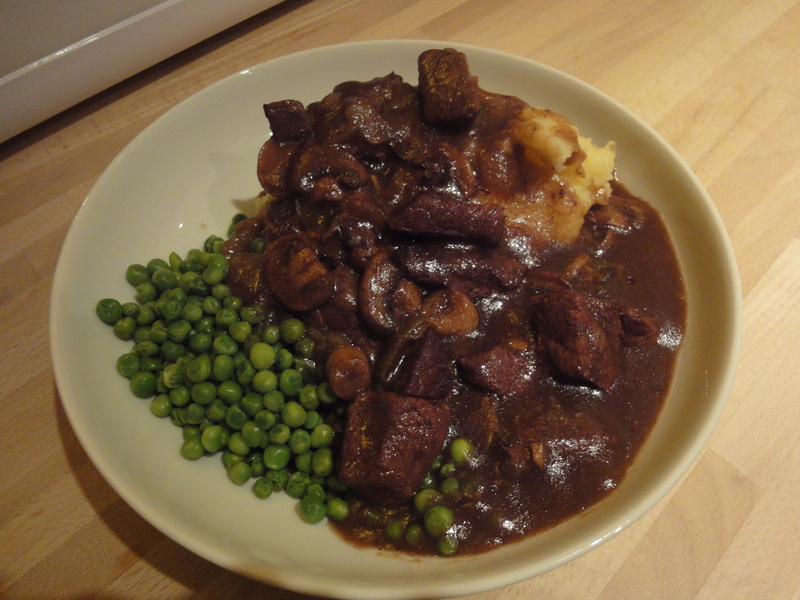 Tonight we are having beef casserole which everyone loves. I will post the recipe on my new page. Hope you are having a Terrific Tuesday. 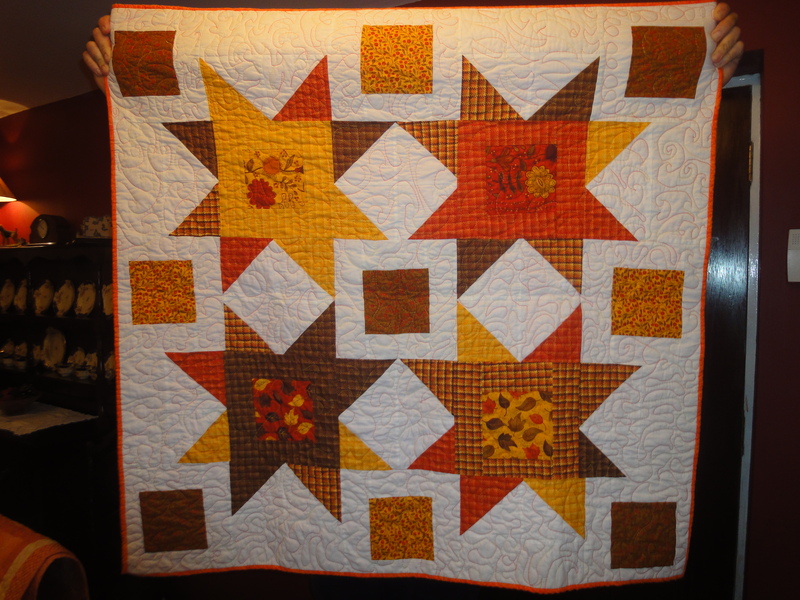 This entry was posted in My Favourite Recipes, My Quilting Projects on January 13, 2015 by scullybooks. Lots of people have asked about the Christmas Cookie recipe for my cookies I made yesterday. So here is my recipe and I have also begun a new page of my favourite recipes. 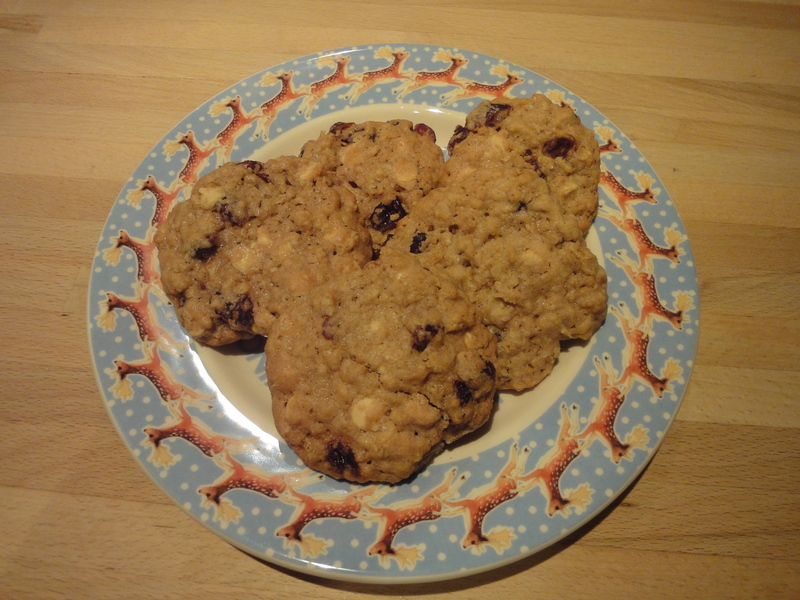 150g Plain Flour, 1/2 teaspoon baking powder, 1/2 teaspoon salt, 75g rolled oats, 125g soft butter, 75g dark brown sugar, 100g caster sugar, 1 egg, 1 teaspoon vanilla extract, 75g dried cranberries, 200g white chocolate chips. * Preheat the oven to 180°C/Gas mark 4 and line a baking sheet with grease proof paper or baking parchment. * Measure the flour, baking powder, salt and rolled oats into a bowl. * Put the butter and sugars into another bowl and beat until creamy. Then beat in the egg and vanilla extract. * Then mix in the flour, baking powder, salt and oat mixture. Finally fold in the cranberries and chocolate chips. * Roll tablespoonfuls of dough into balls with your hands and put onto the baking sheets and squash them down lightly with a fork. Make sure you leave room between the cookies for them to spread. * Cook for 15 minutes and when they are done they should be a pale gold but too soft to lift immediately from the trays. Leave for approximately five minutes to harden and then transfer to a cooling rack. They can be stored in an airtight container between sheets of baking parchment for up to five days or freeze when cooled in a suitable container for up to three months. 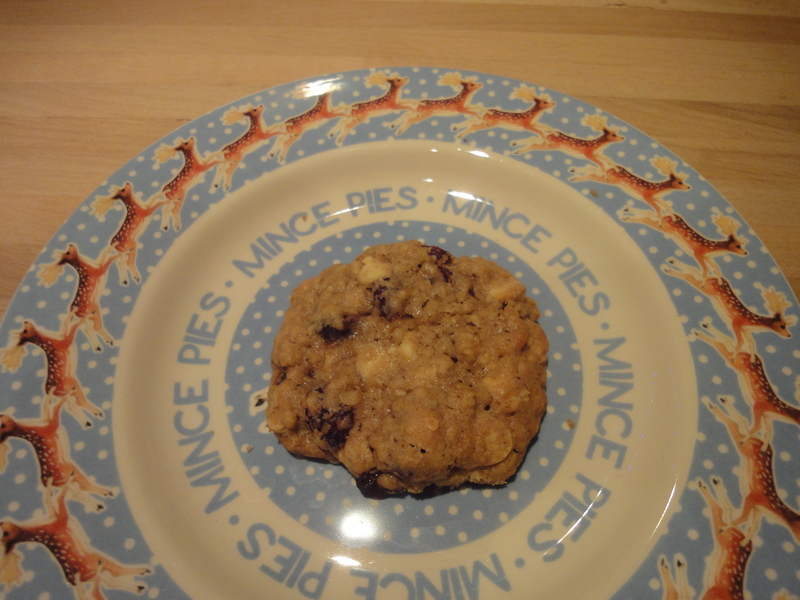 These cookies go down well with children, adults and Santa of course! This entry was posted in Holidays, My Favourite Recipes on December 9, 2014 by scullybooks.